Corporate and academic robotics boffins in the States say they have validated plans for creating a spaceship landing field on the Moon using small droid dump-trucks "the size of riding mowers". You might think that there's no great need for a prepared spaceship field on the Moon - after all, the ships will have to set down vertically on rocket thrust like the Apollo landers, so any old flattish piece of ground ought to do. But you'd be wrong. In space, nobody can see your arse-cleavage. That's because the lunar spaceport field naturally will need to be handy for the planned NASA Moonbase scheduled to be built in the 2020s. Frequent rocket landings and takeoffs from unimproved moon dirt ("regolith") will blast dust and debris all over the base. In the absence of any atmosphere to slow the flying dirt down, and weak gravity making it fall only slowly, this will be the equivalent of sandblasting the base or volley-firing shotguns at it on a regular basis. Thus the concern. Robotics brains at Carnegie Mellon Uni - birthplace of the 600 tonne autonomous Godzilla-lorry landship, among other triumphs - have allied with others from Moon mining startup Astrobotics Inc. The allied boffins came up with two plans. Under the first, a brace of lawn-tractor sized 330lb robot dumptrucks would be delivered to the construction site and build a berm - a wall of piled-up dirt - between landing field and base site. According to the planners, the berm would need to be 8.5 feet high covering a 160-foot semicircle. This would mean shifting 1200 tonnes of dirt, and the diminutive droid-dozers would need six months or so to get the job done. Alternatively, the boffins reckoned it might be possible to cover the landing area with largish rocks, heavy enough not to be blasted about by rocket exhaust but small enough not to be a problem for spaceship landing gear. "To discern the best approach, early robotic scouting missions need to gather on-site information about whether rocks and gravel of the right size can be found at the site," says John Kohut, Astrobotic CEO. Choosing the right location for a Moonbase will be a tricky business, as there are many requirements. A polar location is seen as vital in order to avoid the two-week freezing nights of the equatorial zones, and offer chances for solar power generation. Likewise, nearby water ice would be a huge boon, offering local rocket fuel and oxygen production and lowering costs massively. It's hoped that there might be water ice at the bottom of some of the Moon's deep polar craters. Only after all these matters have been dealt with will there be time to worry about construction materials for landing pads - hence the need for adaptable robot bulldozers, diggers etc, as Astrobotics Inc sees it. The major space-faring nations of the world are heading to the Moon with rovers and crewed expeditions. China and India are targeting the Moon for mineral and energy resources to benefit their citizens. The Moon has several economic uses... For example, the Moon may be a useful source of helium-3... Helium-3 would be a good fuel for clean fusion power generation, when such reactors are developed... propellants created from lunar water could be exported rather than used on site for refueling spaceships. These propellants, delivered to low Earth orbit (LEO), may become a lower-cost way to propel communications satellites from LEO up to geosynchronous orbit, or to propel Mars-bound astronauts from LEO to the Red Planet. Another possibility is mining the Moon for rare platinum-group metals... Some of the Moon’s almost infinite number of impact craters were caused by metal-rich asteroids, some of which may have impacted at a low enough speed to escape vaporization. Metal shipments from the Moon to Earth can be captured and slowed down in Earth orbit by tether-equipped way stations; these way stations can then transfer that energy to upward-bound cargoes from Earth. The metal shipments thus have two values: for use in Earth-side manufacturing, and as replacement for rocket fuel needed by cargo heading up from LEO to outbound destinations such as geosynchronous orbit, the Moon and Mars. 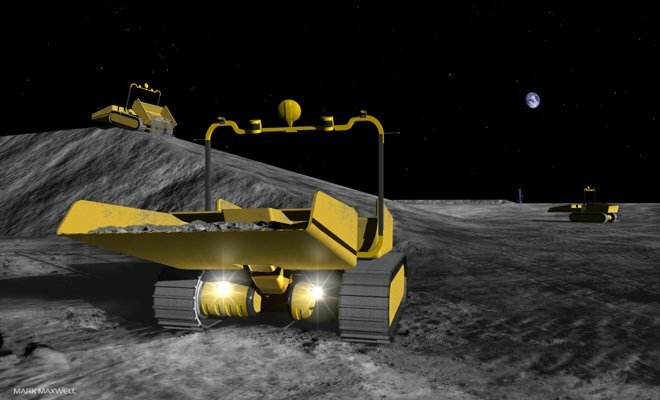 Astrobotic aims to kick off its Moon mining and construction odyssey by winning the $20m Google X-Prize. This will mean visiting the Apollo 11 landing site and transmitting HD video back to Earth, which Astrobotic reckon to do next year.